It isn’t just women who stand to benefit from the use of body lotion, although you wouldn’t think that on account of how most lotions are advertised. As a matter of fact, men are just as likely to suffer from skin problems as women, if not even more so due to the fact that men rarely use skincare products to begin with. It isn’t just the exposure to UV rays that can hurt a man’s skin but pollutants and dehydration as well. With that in mind, then maybe more men should consider using body lotion on a regular basis. 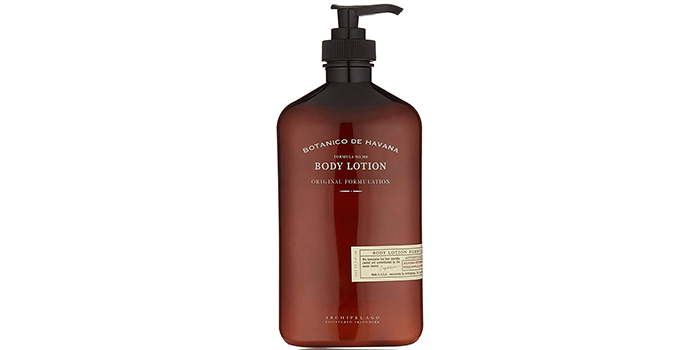 Over the next few minutes, we will take a look at the ten best body lotions for men the market has to offer right now so that we may better understand what these lotions are all about. 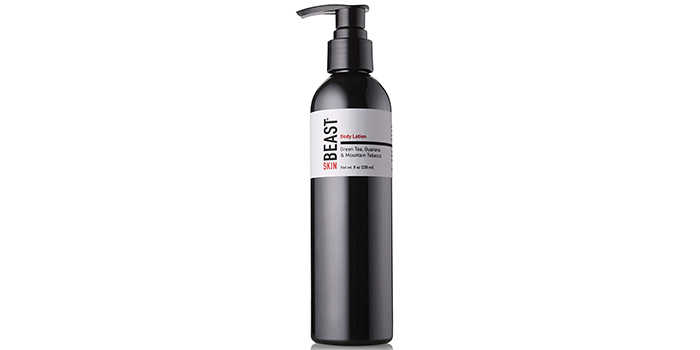 Popularly known for its high quality and effective results, Tame The Beast Body Lotion for Men works wonders on dry skin and hands. Loaded with all-natural ingredients including green tea, chamomile, Vitamin C, E and A, Eucalyptus, sugarcane, comfrey, shea butter, grape seed oil, menthol, mountain tobacco, guarana, lavender, caffeine, sunflower seed oil, cypress, rosemary leaf oil, and Organic Aloe Barbadenis Leaf Juice, this lotion is free from parabens, sulfates, phthalates, paraffin, synthetic colors and scents, petrolatum, DEA/TEA and gluten. Ideal for all skin types, this lotion works best when massaged on the shoulders, neck, and chest. Blended with a unique combination of bergamot leaves and neroli with hints of crushed thyme and coriander, the Archipelago Botanicals Botanico De Havana Lotion aims at sealing in the moisture in your body, helping to keep it soft, subtle and nourished throughout the day. Made with organic elements like coffee beans and tobacco flowers, it features a very mild and distinctive aroma. Not only does it moisturize the skin but it also aims at removing skin redness that is usually due to dry skin and rough skin. MARLOWE 002 Extra Moisturizing Body Lotion is an intensive moisturizing liquid that helps soothe dry skin and leaves your body feeling fresh and nourished. Thanks to its non-greasy formula it provides optimum protection and keeps the skin hydrated throughout the day. Uniquely crafted with a blend of passionflower fruit, green tea, and willow bark extracts, it helps to restore, repair and reduce inflammation of the skin. Free from parabens, phthalates, this skin lotion is vegan and cruelty-free and safe for all kinds of skin. 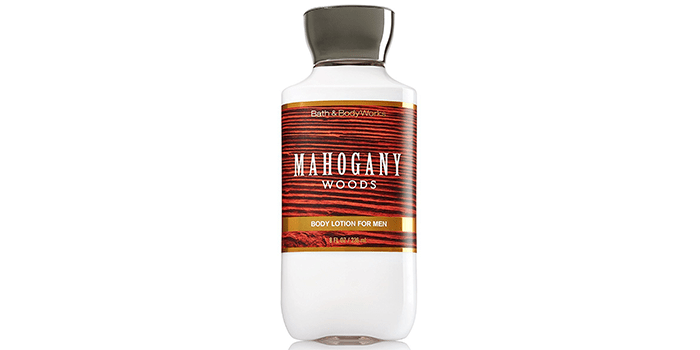 Uniquely crafted with a special blend of mahogany wood, bourbon vanilla, and golden amber, the Bath and Body Works Mens Body Lotion provides a distinctly warm and soothing effect, leaving your skin smelling like the fragrant outdoors. Known for its special ability to moisturize and nourish the skin, this body lotion for men helps with dry rough skin and is suitable for all other skin types. Loaded with all natural ingredients and skin soothing agents, it also helps prevent cracks and keeps the skin subtle and soft. 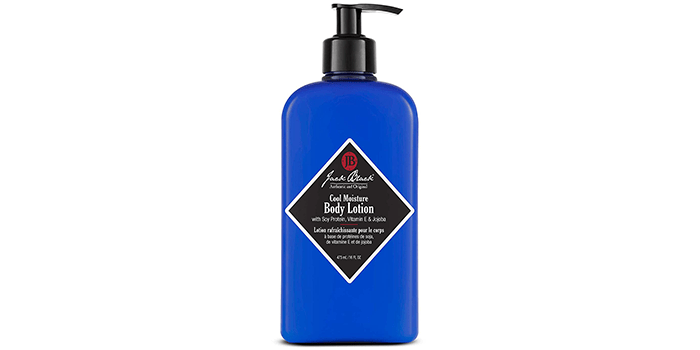 The JACK BLACK – Cool Moisture Body Lotion is a premium quality, lightweight, fast-absorbing skin lotion that helps to hydrate and nourish the skin effectively. Thanks to its special mix of natural ingredients it helps calm and soothes the skin, leaving it cool and refreshed. Blended with cooling agents and special elements, the lotion penetrates deep into the skin helping in nourishing and hydrating the skin completely. Ideal for dry skin, this lotion works best on rough areas like knees, elbows, and feet and works best when applied after a shower. Designed to keep your skin nourished and hydrated in the toughest weather conditions, the Brickell Men’s Deep Moisture Body Lotion for Men is suitable for all ages. Featuring a light, fast absorbent formula, it helps relieve dry skin and prevent cracks. Packed with natural and organic elements, this body lotion includes green tea, Aloe Vera, Vitamin E, and jojoba oil. Ideal for all types of skin, it works at protecting the skin from impurities and tightens the pores effectively. 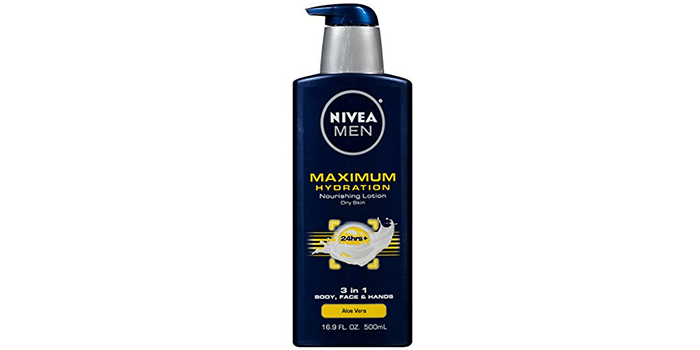 The NIVEA Men Maximum Hydration Nourishing Lotion is a 3-in-1 body care product that is designed for the face, hands, and body. Designed with the special ability to provide nourishment to dry skin and to moisturize the skin, this body lotion leaves your body feeling soft, fresh and well nourished. Thanks to its unique blend of ingredients, it takes a few seconds to get absorbed completely by your skin, without leaving it looking oily or greasy. Ideal for sensitive and dry skin, it helps keep your skin soft for up to 24 hours. Expertly formulated to meet the needs of most men, the No. 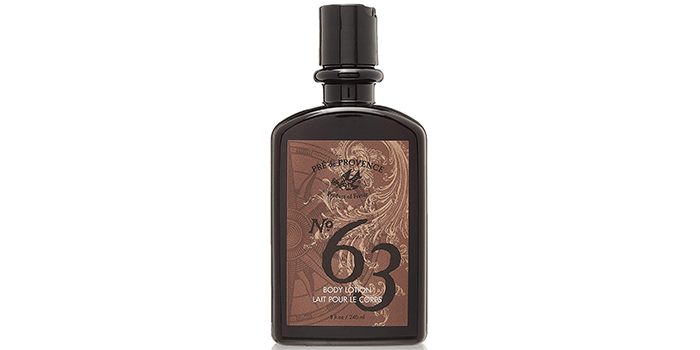 63 Men’s Lotion features a non-greasy consistency that helps in hydrating and soothing your skin effectively. Put together with a blend of Aloe Vera, glycerin and shea oil, it helps to soften and moisturize the skin. Thanks to its fast absorbing formula it hydrates the skin and prevents cracks and nourishes dry skin. Featuring a warm spicy or peppery scent with hints of citrus and dashes of cedar wood, plum, and violet, it comes with a unique blend of aromas. Loaded with an all-natural formula, the Alpha Skin Care – Renewal Body Lotion includes 12% Glycolic AHA that helps in the production of collagen, while reducing fine lines and wrinkles. Suitable for all types of skin, this body lotion aims at removing dry skin and dead skin cells, leaving you with smooth, new and healthy skin. For better, radiant and toned skin and for a softer texture, it is recommended that this lotion is utilized on a regular basis. Free from parabens and artificial fragrances, it is safe to use even on sensitive skin. 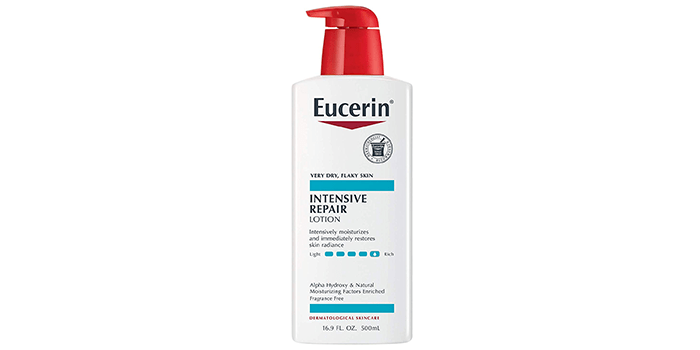 Highly recommended by expert dermatologists around the world, the Eucerin Intensive Repair Enriched Lotion is a high-quality skin care product that works towards restoring moisture back to the skin. Thanks to its unique formula including alpha hydroxyl and other natural elements, it combines together with the skins natural oils and aims at nourishing the skin, leaving it soft and hydrated. Free from artificial fragrances, it is clog-free and safe to use on all skin types. It also helps in exfoliation of the skin and improves the overall appearance of dry skin. Including soy protein, jojoba, vitamin E oil, and macadamia nut oil, this lotion helps slow down the loss of moisture from the skin.